The new Barbie Basics Models Collection 001 is perfect for collectors who love to redress and accessorize their dolls. I confess that would be me. 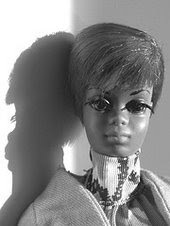 I have bought dolls just for their fabulous ensemble or accessories to adorn another doll. Thank you for this collection, Mattel. I must tell you that I’d planned to only purchase three of the dolls until I saw these photos on Flickr. 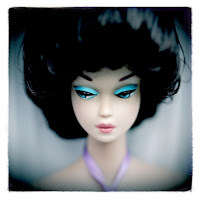 All of the dolls are so much more appealing than the photos on the Barbie Collector site. Customize. Personalize. Play. 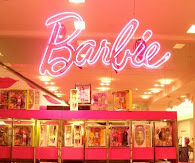 Barbie Basics is all about permission to play. Part of the Barbie Basics Collection, this collection of dolls and fashions is all about customizing the fashion staple, the "Little Black Dress," and making it your own! 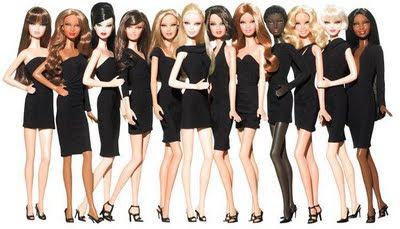 This collection includes 12 different dolls each of which is dressed in a different style of a "Little Black Dress.” Barbie Basics Accessories, sold separately, help you personalize your very own "Little Black Dress" Barbie! As you probably already know, the entire collection is on back order on Barbie Collector and pre-order at many doll dealers on the internet. There may be a few available at your local Toys R Us or other large stores. Shop wisely, as the dolls are advertised on the internet for a wide range of prices. Mattel is, obviously, listening to customers, specially adult collector after bringing out this collection and the fashionsitas I guess they have scored a couple of "well - done" points, it's like a kind of rebirth. I so agree with you. I can hardly wait to redress them!REbirth is such an appropriate word. I've not been this excited about collecting Barbie in quite some time. yo soy fans de las barbies, asi que hagan como se hagan los coleccionare ! !